Of the decommissioned GTW's 3, 6, 7, 16, 17 and 24 I have the whereabouts and photos set. The photo of the GTW 3 was provided to me by the Prüser Bus GmbH, the photo of the GTW 6 Mr. D. Möhrmann, one of the architects of the construction project Gleis 13 in Gütersloh. Many thanks also at this point! Photos of trains 12 and 13 have been added to the new GTW's. The car 5 of the production series 72 is exhibited in the Erlebnismuseum Sinsheim. The museum kindly provided me with photos. GTW 6 stood for one year with an advertisement for Schaeffler in the dare hall. For a few days he is back in regular service and has now found his place here. 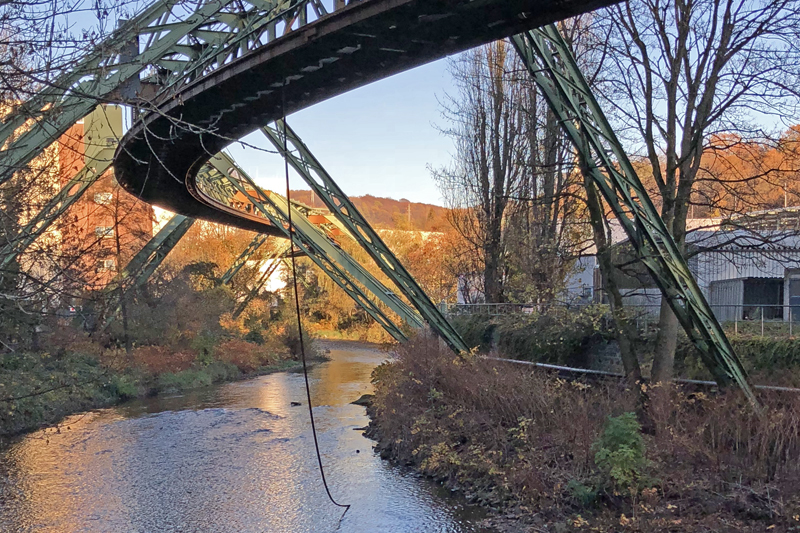 The suspension railway is the most important personal local traffic system in Wuppertal, and at the same time the landmark of the town. It was the alternative at that time to an underground which could not be built in Wuppertal for geologic and topografischen reasons, therefore, the inhabitant of Cologne sugar manufacturer Eugene Langen got the possibility to realise his invention in Wuppertal. Also the name "Suspension railway" comes from long themselves: „A system of the hanging carriages. "I have the thing‚ suspension railway‘ baptised. "“ such a quotation. Besides, the name Suspension railway is actually wrong because in contrast to a magnet suspension railway a constant contact exists between rail and vehicle. The Wuppertaler suspension railway is therefore an onerail overhead conveyor. 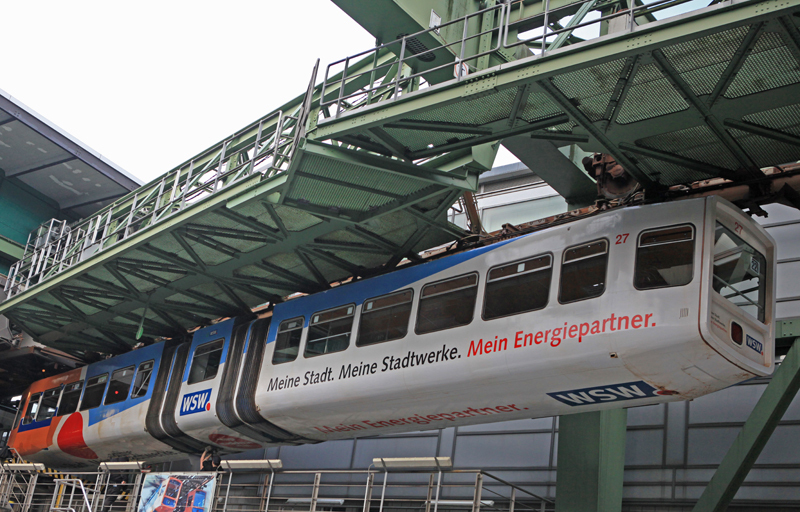 In 1995 one began in Wuppertal with a renewal project of the props, rails and stations and also the vehicles. The complete object was renewed as well as was altered up to three all stops and was modernised technically. On the from the 3rd to the 6th of April, 2014 one celebrated the official end of the removal. Since the 26th of May, 1997 the Wuppertaler suspension railway stands under conservation of monuments and historic buildings. 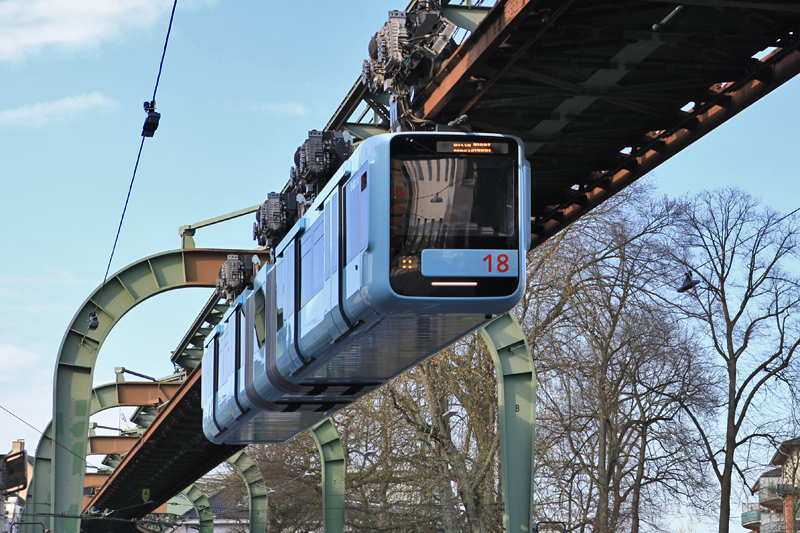 Since 30.03.2019 the suspension railway is on the way again for test drives. In the next two weeks, the new vehicles and the operating system are tested and tested. that the track is back to normal in early August. The investigation into the accident in November are now set, the cause of the busbar demolition was not previously recognizable material wear. After the demolition of the track in November 2018, our landmark stands still. Probably in August 2019 it goes back to normal operation. The reasons for the accident are now fixed. At the beginning, probably two holders of the busbar were defective, which was itself in this curve area under tension. This damaged further holders. Since the driving operation was still taking place at this time, pantographs of the first track were demolished and other brackets damaged, the next train passage then provided for the demolition of the busbar. Meanwhile, a new power rail is mounted, but on the entire route, the busbars are to be secured against another demolition. In Vohwinkel, the exchange of old GTW's continues against the new railways. GTW 27 is being prepared for disassembly.